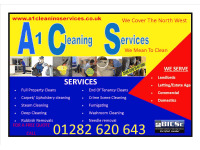 Here at A1 Cleaning Service we offer a whole range of cleaning services. You don't have to have different companies to come in and do different jobs, CALL US INSTEAD!, we will do it all. We offer free no obligation quotes. 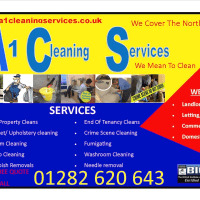 I would recommend A1 Cleaning Services. They did an excellent job when cleaning a house after tenants had left. I couldn't believe the difference, they did everything, cleaned carpets, kitchen, cooker, paintwork, bathrooms, outside paths and removed all rubbish, all for a reasonable price. I wouldn't use anyone else. I have used A1 Cleaning Services a number of times and they have always done an amazing job, efficient, professional, always on time and nothing to much trouble. Carpets and ovens come out like new, and at a reasonable price. I would highly recommend them.